Complete system with all-in-one touch screen computer and Image Pilot Software. 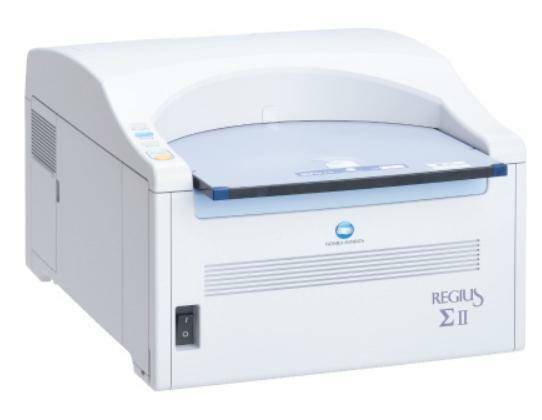 The REGIUS Σ is Konica Minolta’s smallest and lightest CR. The desktop CR has a footprint of only 0.31m2 and weighs a mere 28kg. The REGIUS Σ was designed with the environment in mind. Energy consumption has been reduced to 100VA – about the same as a house hold light bulb. That’s one tenth the power of the smallest film processor. Important with power costs soaring. The REGIUS Σ supports pixel sizes of 87.5μm and 175μm for all cassette sizes, achieving a maximum resolution of 4020×4892 pixels (35x43cm at 87.5μm). Integral Processing – the result of Konica Minolta’s vast imaging experience – is a robust algorithm that produces the optimum diagnostic image automatically. This patented technique greatly simplifies x-ray image acquisition while delivering incredibly consistent image quality and virtually eliminating retakes.